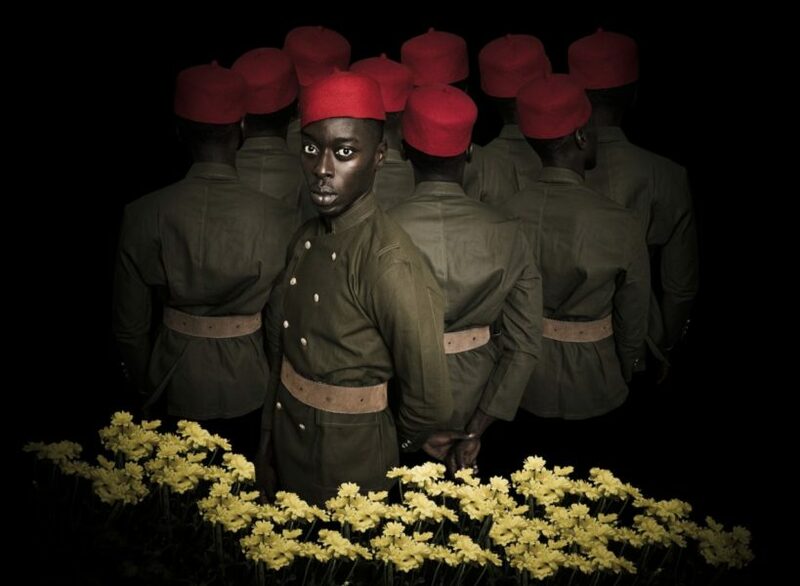 Aside from a brief appearance at the 1:54 Art Fair in 2015, the current exhibition at the Autograph ABP gallery in Shoreditch is the first time Omar Victor Diop has presented work in the UK. The show that now occupies the airy ground floor gallery presents photographs from two bodies of work and is a substantial introduction to the practice of an artist with a most distinctive voice. Diop lives and works in Dakar, the thriving capital of Senegal in West Africa. The sophisticated cultural life of the city with its rising middle class, and the energy of the very young population there, defy lazy preconceptions of what an African city might offer. 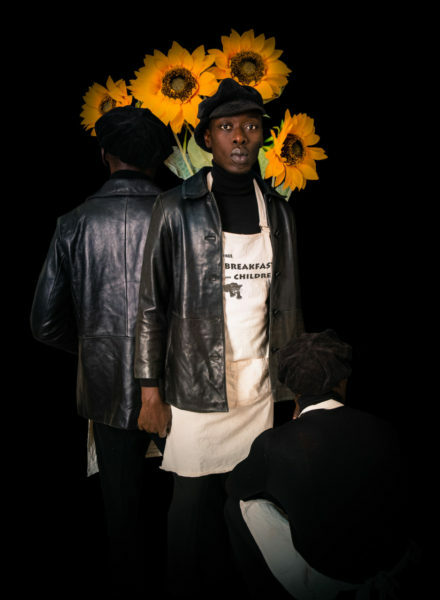 Diop is part of a scene that encompasses fashion, music, literature and art, and since 2011 he has made his friends of young artists and entrepreneurs the protagonists of an ongoing series of photographic portraits – Studio of the Vanities. In 2014, however, Diop undertook a residency in Malaga, Spain. Separated from his friends and peers, for the first time he stepped in front of the camera himself and became his own model. The two bodies of work represented here, Liberty and Diaspora place Diop very recognisably centre-stage. This is no Cindy Sherman-style exploration of alternate personas, nor are the works psychologically expressive in the way of, for example, Francesca Woodman. The period spent in Europe exposed Diop to the tradition of portraiture here from 16th through to the 19th century. He was struck in particular by Diego Velázquez’s painting of his assistant Juan de Pareja (c.1650) – a man of North African descent, also a painter, whom Velasquez eventually freed. This discovery was the start of a search for other depictions of Africans of note and accomplishment. Thus we meet Dom Nicolau, Prince of Kongo, and perhaps the first African leader to denounce the injustices of colonialism, with a letter of protest published in a Lisbon newspaper in 1845. And Dutch mining engineer Kwasi Boakye, born a prince in the Ashanti kingdom of what is today Ghana and educated in the Netherlands and Germany. He is pictured as in his graduation photograph from the university of Freiburg. Common to all the depictions of extraordinary men is the inclusion of a thoroughly anachronistic football accessory. Dom Nicolau is resplendent in golden robes, with one foot resting on a football; Boakye nonchalantly dangles a football boot over his shoulder. Diop’s collision of the historic portraits with contemporary sport is intended to make a point about the enduring lack of acceptance of Africans – even when they are revered for their achievements. He talks about the ‘footballing royalty’ of African players in European teams, who can still be targets for outright racism, in spite of their ostensible inclusion at the heart of European popular culture. 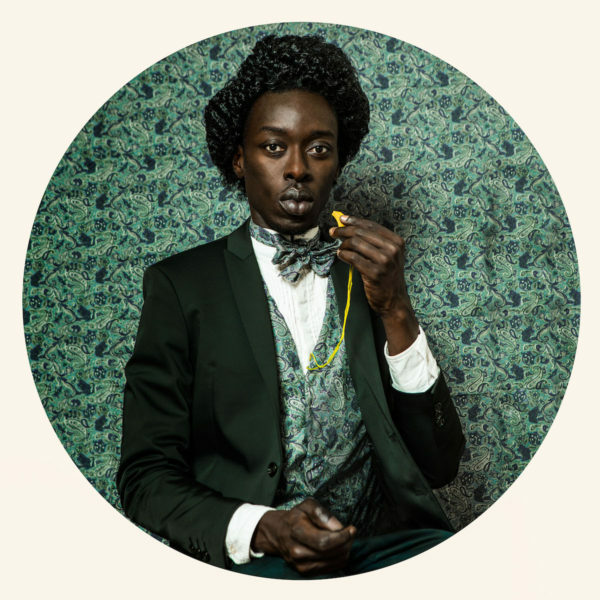 Continuing the exploration of formally staged portraiture, Diop again uses himself in the second series of works here, Liberty. In these, Zelig-like, Diop inserts himself into historical episodes from the Black Panther movement in the United States to the Soweto Uprising of 1976 and up to the present day. Sometimes he plays multiple characters, sometimes male and occasionally female, creating tableaux that illustrate and commemorate moments of uprising, resistance and trauma. The Women’s War of 1929 is commemorated, in which women in southeast Nigeria rose up against the British colonial rule that imposed taxes on female market traders and undermined their traditional status. The most recent image, and the only one in which Diop does not face down the viewer, is of the prone body of Trayvon Martin, whose murder in Florida in 2012 helped spark the Black Lives Matter movement. 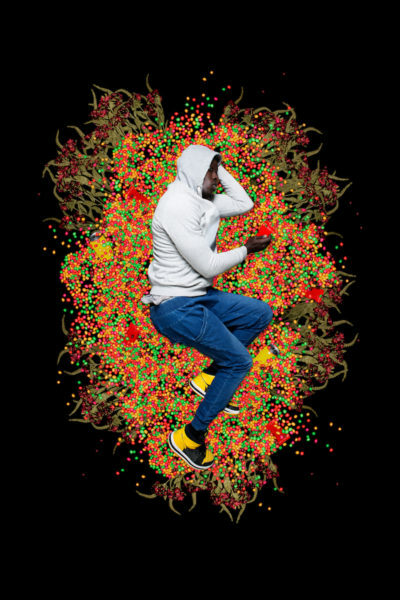 He is shown surrounded by Skittles sweets, scattered around his body like a halo, or aura. Martin had purchased the sweets just before he died and they have become a contemporary symbol of the injustice and systemic racism that the African American community endure. 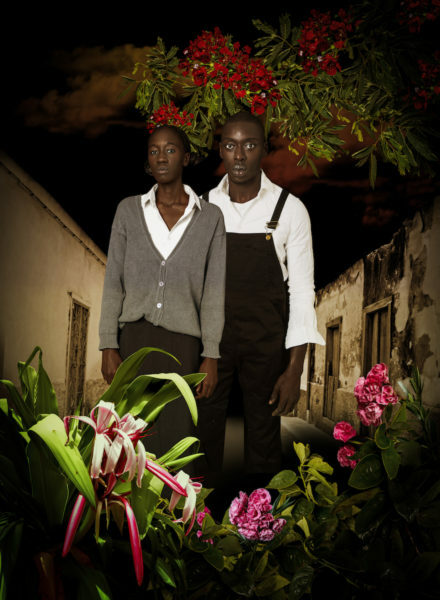 The great Malian photographers Malick Sidibé and Seydou Keita are compass points for Diop, and it is significant for an artist that has a parallel practice in fashion photography that he also cites Richard Avedon and Annie Leibovitz as influences. 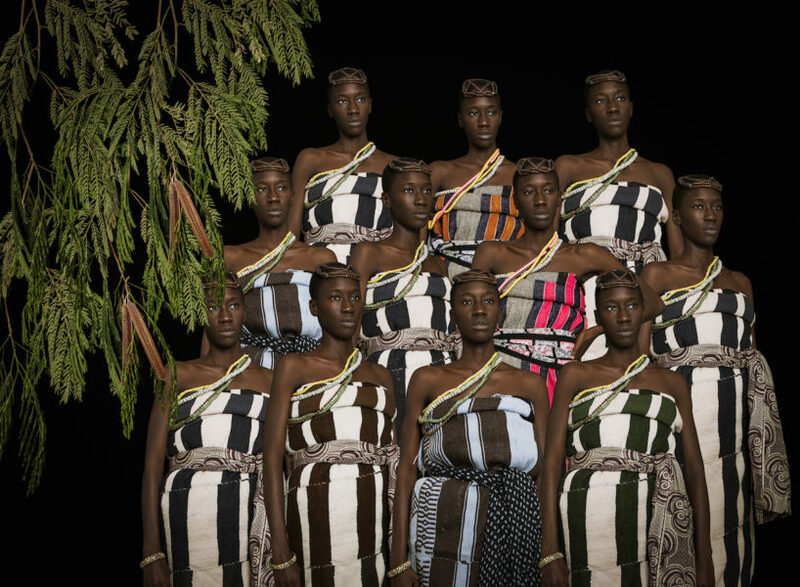 The richly patterned fabrics Diop uses, in both clothing and backdrops, are familiar from the African portraitists’ work, and Diop has been careful to emphasise the role that textiles play in Senegalese life – different designs and fabrics being used to mark the passage of important life stages. The flat lighting, formal studio compositions and unvaryingly gorgeous costumes nod to 19th century orientalist painting, via 20th century fashion photography. Diop’s exhibition delivers important lessons in recuperated histories, along with a powerful serving of pure visual pleasure. Highly recommended.